When it comes to your wedding registry, you may be wondering how to get started: where to go, how many items to register for, and when you should have it completed. We’re here to help! In this post, we’ll show you nine wedding registry mistakes to avoid so you can have more fun + skip all the added stress. Enjoy! Mistake #1: Registering too late. You should register for your wedding seven to nine months before your big day. If you register too late, you’ll be rushing yourself to hurry and complete your list. However, if you register early enough, you can always add on items (or remove them, if you change your mind) later. Plus, wedding guests AND shower guests will have access to your wedding registry with plenty of time to spare. Mistake #2: Forgetting to include your address. 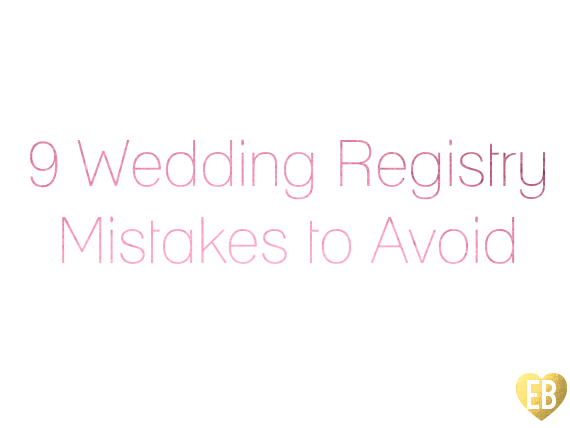 Mistake #3: Registering only at one store. We recommend registering at more than one store. Typically, two stores is plenty; a third option (like an online registry) can also be added. Why more than one store? Shoppers have their preferences and simply may want to shop at one place over another. Also, if a particular store isn’t near a guest’s home, they have another option. Even if everything is online, many guests like to see the item in person before deciding to buy it. Mistake #4: Trying to register all at once. This is probably the most common mistake couples make when registering: they try to do it all at once. Don’t! Registering is fun — it’s one of only two times in life (marriage and having a baby) when you get to go shopping and add things to a list and PEOPLE WANT TO BUY THEM FOR YOU. So, enjoy! Take your time, move a section at a time, and enjoy the time spent together. Also, there should always be this unspoken rule: when one of you starts to get tired / hungry / crabby / tired of scanning stuff / the fun is wearing off, agree to call it a day. You can always add items to your registry later (online or in-person). Mistake #5: Registering when you’re hungry. Oh my goodness, be well-rested, full, and hydrated when you go. Believe it or not, it can be quite tiring! Mistake #6: Not registering at all. Some couples feel sheepish about registering because they feel like it’s asking guests to buy them stuff. While that seems like a logical explanation, take it from a guest’s point of view: we WANT to buy you stuff. But we want to buy you stuff you ACTUALLY want. And, it totally helps us when you are very specific and give us a list that is basically like, “Here are things we think are cool” it will be 10000x easier on the wedding guests. And, even if all you want is cash, it’s a) impolite to ask for cash, and b) you’ll still get cash from some guests, while others will always prefer to send a tangible item. Mistake #7: Not registering together. Don’t register separately or take a friend instead of your spouse-to-be. Even if your hubby-to-be doesn’t think he will have any fun, ask him to go anyway. And, make sure you don’t totally make the registry all about you — it should be a joint effort and make sure his personality is reflected in the items selected, too. Mistake #8: Registering for only practical items. Have a little fun with it! We’re not saying to go overboard and ask for things you’ll never use, but if there’s a fun gift that you would love to own and would perhaps never get to buy yourself (like a Margarita maker, a really fancy set of wine glasses, fine china, or one of these), add it to the list! It doesn’t hurt to add it on and, who knows, you might just get it. Mistake #9: Registering only at big box chains. Have we taught you nothing at Emmaline Bride? WE LOVE HANDMADE! Don’t forget about the handmade, independent gifts out there, too. You can sign up for an online registry like this one and you’ll be able to add anything from any store to your wedding registry. What wedding registry mistakes would you add to the list? Comment below. We’d love to hear from you! Great point, Tara! I agree with you on the seasonal items. I suppose we should have added that in, as far as for items that rotate regularly. I guess for more general items — towels, bathroom accessories, kitchenwares — these things don’t change all that much depending on season. However, you have a great point. I found that issue with some baby registry things, where we registered and the collection changed right before our shower, so we had to add new items. This happened randomly, not as a seasonal change but rather with one chain’s inventory. Perhaps it would be better to say register as early or as late as you’d like, but keep an eye on your registry as it gets closer. This was all really great advice except I must disagree that you should register 7 to 9 months ahead of time. Retailers have set schedules of how seasonal items rotate throughout the store. Based on your advice, my wedding planned for August would mean that I should register right before, in the same month, or just after Christmas time. Horrible advice. 50% of retail items at that time will be seasonal and not at all related to my late summer wedding. Spring and summer items will begin to hit stores mid-February which is when I should actually register. You don’t know how many times I’ve had friends who registered too early and by the time the event rolled around (we’re talking 2-3 months out), 20% of the registry was no longer available in store or online.